We consider general MCDA models with discrete attributes. These models are shown to be equivalent to a multichoice game and we put some emphasis on discrete Generalized Independence Models (GAI), especially those which are 2-additive, that is, limited to terms of at most two attributes. The chapter studies the interpretation of these models. For general MCDA models, we study how to define a meaningful importance index, and propose mainly two kinds on importance indices: the signed and the absolute importance indices. For 2-additive GAI models, we study the issue of the decomposition, which is not unique in general. We show that for a monotone 2-additive GAI model, it is always possible to obtain a decomposition where each term is monotone. This has important consequences on the tractability and interpretability of the model. Grabisch, M., & Labreuche, Ch. (2008). 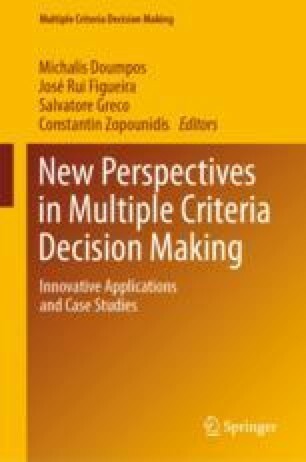 A decade of application of the Choquet and Sugeno integrals in multi-criteria decision aid. 4OR, 6, 1–44. https://doi.org/10.1007/s10288-007-0064-2. Ridaoui, M., Grabisch, M., & Labreuche, Ch. (2018). An interaction index for multichoice games. arXiv:1803.07541.